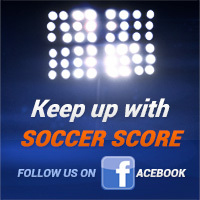 SoccerScore.com is a premium live score service covering soccer matches from all over the world and providing updates in real time. Be the first to know when a goal is scored or red card is awarded at football games across the globe and always stay close to the action. Soccer matches available on the website will be covered in great detail, with starting line-ups, bookings, substitutions and more just a click away. While live coverage will always be at the forefront, SoccerScore.com is also a place where you can find soccer news, fixture lists, results and in-depth statistics on all the competitions we cover. Our mission is to deliver the action from soccer venues directly to your desktop, mobile or tablet, so as to ensure that you are kept abreast of the latest developments in case you are not in a position to watch the games live. Whether you are a soccer fan searching for info on your favourite club or betting enthusiast looking for valuable team news before placing a wager, chances are that you will be impressed by our news section, which will feature articles covering Europe's elite competitions such as Premier League and Champions League, as well as other top European championships and international tournaments. Team news, injuries, suspensions, player changes, managerial changes, match previews, game reviews, pre-match and post-match conferences, you name it, we will have it covered. Keeping track of forthcoming fixtures is not always an easy task, even for top European leagues, seeing as how governing bodies are forced to make changes to the calendar due to team's European games, domestic cups and unforeseen circumstances. SoccerScore.com team will be on the constant lookout for the official announcements to ensure our customers always have access to updated fixture lists and never miss an important game. Rather than visiting league's official websites one by one, you can simply access our fixtures section and be confident that displayed kick-off time is 100% correct. As football fans, we are well aware of the importance of having instant access to live results, courtesy of Livescore.in, no matter where you are at the moment, and that is precisely why we at SoccerScore.com will strive to notify you of each and every event from soccer venues everywhere the moment it occurs. Never miss a kick again with our live score service and follow the latest developments in real time on your desktop or handheld device. There is no cause for concern even if you miss the game altogether as results of finished games are also displayed on our website. Soccer statistics have become a useful tool in predicting the outcome of matches and as such stats have an important place on our website. We will be offering extensive statistics on top competitions from around the world, including tables, results of past matches, head to head records, home and away form, as well as featuring key player statistics such as goals, assists, yellow and red cards and many more. All these things together will ensure you have access to the best possible coverage available on the web, and it will be up to you to use the info as you best see fit.